Move Over, Brady. The Patriots’ Running Backs Are Stealing The Show. New England is using its running backs through two playoff games at a rate that would have led all 32 teams in the regular season. The identity of the New England Patriots has been not having an identity. What’s made them so difficult to beat in the Tom Brady era is an amorphous quality that has them adapting a game plan effortlessly to any opponent. So the team’s emphasis on the run versus the pass — and to whom the passes are targeted — historically has changed based on where the defense of that week’s opponent is most vulnerable. 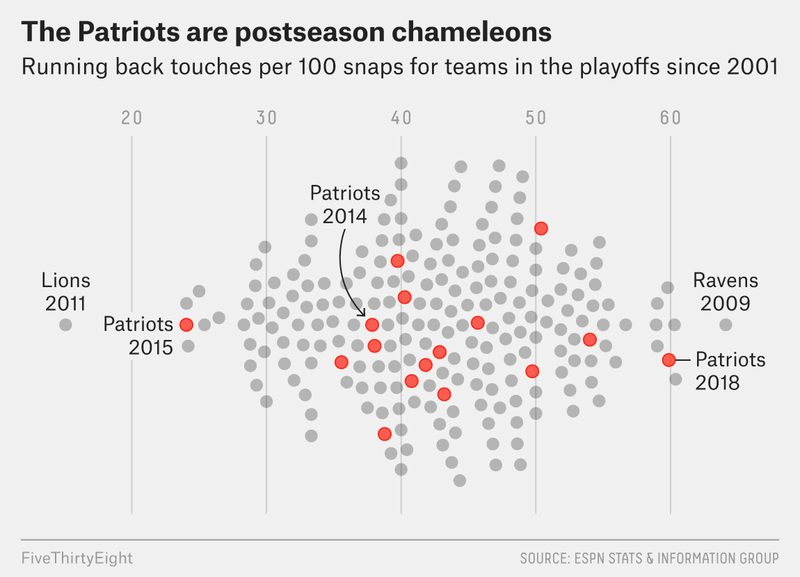 But the Patriots’ identity this season has seemed to take on a more specific shape — particularly in the postseason. Over the past two wins, the Patriots have become a power-running, ball-control passing team that has their offense flow through their backs. And even more shockingly, they often indicate whether they are going to run or pass based on who they have on the field. They are winning less with deception, instead simply daring the defense to stop them. This postseason, nearly 59.9 percent of New England’s offensive snaps have ended with the ball in the hands of a running back (meaning a run or a completed pass to a running back), according to ESPN’s Stats & Information Group. Since 2001, this is the fourth-highest running back usage rate among playoff teams. New England’s running back usage rate was 12 percentage points lower during the regular season — though its share of 47.5 percent was still the sixth-highest in the NFL. Rather than dialing down their running back usage and putting the season in the hands of the NFL’s greatest quarterback, the Patriots have dialed the RB game up to 11. This increase in running back usage is the highest in the 16 postseasons of the Brady-Bill Belichick era. Belichick and his coaching staff have typically chosen to go in the other direction — in 12 of those postseason appearances, the rate of running back touches went down. That includes last season, when it declined from 49.5 percent during the regular season to just 38 percent in their playoff run, which ended with a pass-happy Super Bowl shootout loss to the Eagles. And not only can the defense reasonably guess that the ball is going to a running back, it can determine with an even higher degree of certainty whether Brady is going to hand off or pass depending on which running back is in the huddle. In the regular season, when Sony Michel was on the field, the Patriots ran the ball 75.9 percent of the time. But when the Patriots subbed in James White, the Pats ran on only 23.8 percent of plays, while the Pats threw the ball the other 76.2 percent of the time. In the postseason, rather than seeking to cross up the opponent, their tendencies have somehow gotten even more extreme: 83.8 percent of plays with Michel on the field have been runs, while 89.2 percent of snaps with White have been throws. In the process, the Pats scored 78 points in their two wins and rolled up 1,022 yards, well above their per-game regular-season averages of 27.3 points (fourth most) and 393.4 yards (fifth). So, the game plan may be predictable, but it’s working. The Patriots have long championed passing to a running back, given that they drafted White in the fourth round in 2014 and quickly made him a receiving specialist with more career catches than rushes. But this heavy reliance on the run is a new identity for them. As recently as the 2015 season, their rate of running back usage in the postseason was just 24.1 percent, which ranked above only the 2011 Lions among all 216 playoff teams in the sample. Last year’s team ranked 158th in postseason running back usage. And their Super Bowl-winning edition in 2016 was 132nd. The last time a Brady-led Patriots playoff team was this running back-centric was in 2004, when the team had Corey Dillon and Kevin Faulk. With 54 percent (21st) running-back usage, that team beat the Eagles in Super Bowl XXXIX. It’s unknown whether this transformation was by necessity or design. There’s no doubt that the passing game is without its full arsenal. No one expected a healthy Rob Gronkowski to virtually disappear as a receiving threat (149 yards in his past five games, though 79 came in the AFC championship). And the tight end’s ineffectiveness comes after former All-Pro wideout Josh Gordon in December first “stepped away” and then was suspended indefinitely from football for violating the terms of his reinstatement after he was previously suspended under the NFL substance-abuse policy. Brady, for his part, has really ramped up his checkdown game. During the regular season, the Pats connected on just 74.8 percent of passes to backs (mainly White) within 5 yards of the line of scrimmage, which ranked the Patriots 28th in the NFL. New England’s success rate1 on these plays was just 49.7 percent, barely above the NFL average of 45.9 percent. But in the postseason, those numbers have climbed to a 85.2 percent on 27 passes to backs, including seven first downs, and a playoff-leading play success rate of 63 percent. Even though running their offense through their backs was a trademark of New England’s regular-season success, we can’t dismiss the possibility that it just perfectly aligned with the weaknesses of its playoff opponents. The Patriots’ divisional-round foe, the Chargers, were reasonably stout against the run (12th in yards allowed per rush); but they had transitioned to a defense featuring smaller defensive backs in place of linebackers. And they were just 24th in the regular season on defensive play success on passes to running backs. The Chiefs were poor both against the run (31st in yards allowed per rush) and in preventing success on running back passes (31st). The Rams are a mixed bag, actually ranking last in yards allowed per rush but first in preventing success on tosses to backs. That could end up meaning a lot more Michel and a lot less White in the Super Bowl. Or, given the Patriots history, this could all be an elaborate con — and Brady may cross up Los Angeles completely by throwing early and often to Gronkowski and his wide receivers. Success rate is the percentage of plays that are positive in Expected Points Added.